The city of Fort Worth is paying homeless people to pick up trash as part of a unique program to clean up the city and turn lives around. 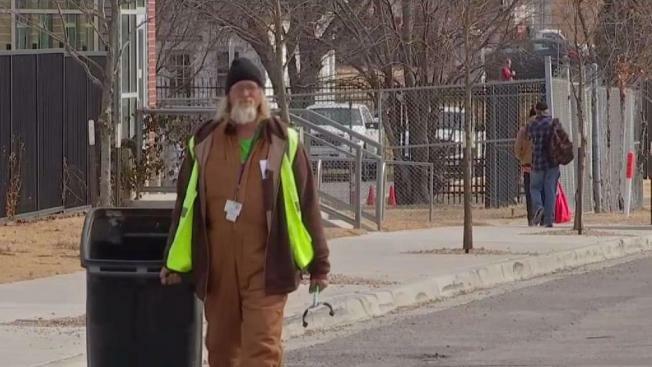 Frank Crist, 53, earns $10 an hour to pick up litter in the area southeast of downtown where many homeless people live. He also gets paid vacation and benefits. "It just makes you feel better keeping it cleaned up," he said. "It means a lot. I mean, with my record and stuff, I really had no other place that would hire me." Crist served prison time for drugs and ended up on the street. He now lives at the Presbyterian Night Shelter, which hired him as part of a program called Clean Slate. The city pays for it. The shelter runs it. "It is a win-win," said Presbyterian Night Shelter CEO Toby Owen. "We want a clean neighborhood that speaks hope, that speaks dignity to our homeless guests. And it also provides income for these individuals so they can move out and be successful without living in a homeless shelter." Last year, Clean Slate put 40 homeless people to work, Owen said. Approximately 3,856 tons of trash was collected by Clean Slate workers. And they don't just clean up trash on the street -- they also work as janitors for businesses. Crist is about to move into an apartment — after 23 months in the shelter. "It took me about a year, a year-and-a-half, but everything is coming together," he said. "It feels great. Didn't think it was ever going to happen again, but now it has." Crist says he will continue to work for Clean Slate even after he moves into his new apartment. The city now spends about $48,000 a year on the program. Owen said the shelter is working with the city to expand it next year.